Bacterial contamination of meat is an ongoing problem and everyone wishes for an easy fix—one that does not require meat producers and packers to prevent contamination. Food Production Daily reports that hitting meat with electrical current reduces toxic E. coli O157:H7 on meat surfaces by 2 log units. The research report says researchers inoculated meat with the bacteria and then applied electrical current. But by inoculation they must mean just on the surface, because they only counted surface bacteria. Surface bacteria, alas, are not the problem. Searing meat effectively kills surface bacteria. Bacteria in the interior (of hamburger, for example) survive unless the meat is well cooked. And 2 log units is unlikely to be good enough for bacteria that cause harm at low doses, as this kind does. The FDA requires a 5 log reduction for fresh juices, for example. I wish researchers would apply their talents to figuring out how to keep toxic bacteria from getting into and onto animals in the first place. Then we wouldn’t have to worry about designing techno-fixes to deal with contaminated meat. Food Irradiation: FDA Could Improve Its Documentation and Communication of Key Decisions on Food Irradiation Petitions (GAO-10-309R, February 16, 2010, 23 pages). labels on food products subject to FDA jurisdiction do not have to be reviewed and preapproved by FDA before marketing. Rather, the processor is responsible for properly labeling its products. In fact, FDA officials told us that they do not collect information on how irradiated foods are labeled and marketed. In contrast, USDA reviews and preapproves all labels before use on meat and poultry products and has denied label submissions that do not meet its requirements…FDA does not require the product’s ingredient list to disclose that a particular ingredient has been irradiated, while USDA generally does. 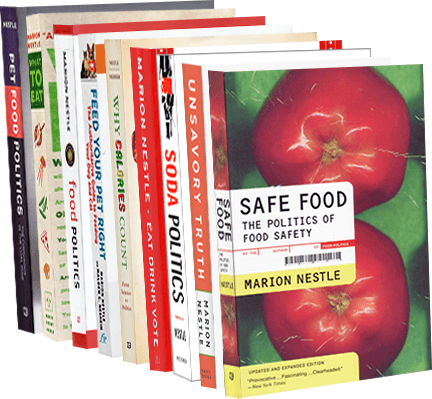 Food Safety: FDA Should Strengthen Its Oversight of Food Ingredients Determined to Be Generally Recognized as Safe (GRAS) (GAO-10-246, February 3, 2010, 69 pages). FDA only reviews those GRAS determinations that companies submit to the agency’s voluntary notification program…the agency has not systematically reconsidered GRAS substances since the 1980s… FDA has largely not responded to concerns about GRAS substances, such as salt and the trans fats in partially hydrogenated vegetable oils, that individuals and consumer groups have raised through 11 citizen petitions submitted to the agency between 2004 and 2008…FDA’s approach to regulating nanotechnology allows engineered nanomaterials to enter the food supply as GRAS substances without FDA’s knowledge. In contrast to FDA’s approach, all food ingredients that incorporate engineered nanomaterials must be submitted to regulators in Canada and the European Union before they can be marketed. Food safety note #1: This arrives in the middle of the latest set of FDA recalls, this time of nearly 100 products made with a flavor enhancer, hydrolyzed vegetable protein, contaminated with Salmonella. Food safety note #2: the Produce Safety Project at Georgetown University has estimated the cost of foodborne illness: $152 billion annually, of which $39 billion is due to leafy greens and other vegetables. Food and Drug Administration: Opportunities Exist to Better Address Management Challenges. (GAO-10-279, February 19, 2010, 54 pages). Through reviewing reports…GAO determined that FDA’s management challenges include recruiting, retaining, and developing its workforce; modernizing its information systems; coordinating internally and externally; communicating with the public; and keeping up with scientific advances…While FDA has taken steps to align its activities and resources to strategic goals, these efforts in its centers and offices are not clear, making it difficult to connect the agency’s use of resources to the achievement of its goals. If you feel gossipy (or want to interpret the raw data for yourself), you can read what FDA staff actually told GAO interviewers. The guidance does not clearly indicate when certain enforcement actions should be taken for an egregious act–one that is cruel to animals or a condition that is ignored and leads to the harming of animals. A noted humane handling expert has stated that FSIS inspectors need clear directives to improve consistency of HMSA enforcement. According to GAO’s survey, FSIS’s training may be insufficient. This, one can only assume, is an understatement. The GAO does important work, no? Now if only government agencies would listen to it. It contains not a trace of apology. It says meat is much safer now due to industry efforts. It considers E. coli O157:H7 a “fact of nature” like floods or flu (i.e., unpreventable). It blames the USDA for meat safety problems. Why the USDA? The USDA will not let meat packers irradiate carcasses to sterilize them. Is irradiation the key to meat safety? It kills bacteria, no question. And it does not make meat radioactive. But the sterilization is incomplete and temporary and irradiated food must be handled like fresh food. As I discuss in my book, Safe Food, E. coli O157:H7 most definitely is preventable. That is why I view irradiation as a late stage techno-fix. It zaps dirty meat and lets this industry get away with producing dirty meat in the first place. If you do weigh in, be sure to refer to Docket No. FDA-1999-F-2405 (formerly 1999F-5522). The request for comment isn’t posted yet, but presumably will be soon at the Constituent Update site. And here’s what the European food industry community has to say about this. Should herbal supplements be irradiated? NOTE: Correction to this post. I must have been asleep when I wrote it. Sorry! Apparently, the Herbal Products Association has petitioned the FDA to allow herbal supplements to be irradiated at doses high enough to kill contaminating bacteria. The American Public Health Association says this is not a good idea. I don’t think so either, of course. I call irradiation a “late-stage techno-fix,” meaning that it takes dirty products and sterilizes them. Shouldn’t the dietary supplement industry get its act together and produce clean supplements to begin with?